G. Jean Rutledge, age 86 of Troy, passed away Wednesday, February 6, 2019 at Hospice of Miami County. She was born September 22, 1932 in Apple Grove, WV to the late Charles and Sylvia (McCarty) Wood. Jean is survived by her husband Donald Rutledge, who she married August 27, 1955; children Brent, Dora, Brenda, Keith and Robin; grandchildren Megan (Jason), Lindsay (Josh), Ryan (Maci), Anthony (Chelsea) and Elizabeth; great-grandchildren Bryce, Baylie, Tinzley, Izabella, Silas and Joshua; and brother Larry Wood (Ann). 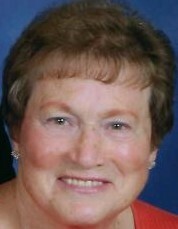 Jean was a 1949 graduate of Christiansburg-Jackson High School and a member of First United Church of Christ in Troy. She was a loyal supporter of Troy Post 43 Baseball and was an avid volunteer for her church and her community. She was the secretary of food services for 22 years for Troy High School. Above anything else, Jean’s focus was on her family. She was a wonderful, supportive, loving wife, mother, grandmother and great-grandmother. She would attend any school or sporting event that her family was involved in. She will be greatly missed by them all. A funeral service will be held 11:30AM Wednesday, February 13, 2019 at Fisher-Cheney Funeral Home, Troy with Pastor Lauren Allen officiating. Visitation will be from 10:00AM-11:30AM at the funeral home prior to the service. Interment to follow in Riverside Cemetery, Troy. In lieu of flowers, memorial donations may be given to the Backpack Program and the Share-A-Meal Program at First United Church of Christ.